Our Search Engine Optimization consultation services are contrived for businesses and individuals with centralized marketing in place who feel they could use professional advise. At R & R Consulting we work with our clients to offer quality design and search engine optimization services to assure your marketing targets are fulfilled. Our services help provide you that cutting edge in your industry field to offer more visibility and traffic to your products or services to exceed your goals in profitability and establishing your website. SEO or more commonly known as Search Engine Optimization is a key tool to help market and advertise your website. Search engine optimization provides key data for search engine providers to help guide more traffic to your website. By optimizing your website you are providing top search engines such as Google, Bing, or Yahoo to crawl through your site with ease and to allow your site to be ranked alongside the top businesses in your industry. Search Engine Optimization works by inputting the right amount of data into your site to improve visibility and traffic to your website. The key data or description is then inputted and submitted to major search engines. Then the top pages ranked in relevant to yours are then listed on a mathematical algorithm based on search queries and sitemaps etc. Hence, the higher a website is ranked in a search engine explains the higher amount of visitors the sight gets in relation to the content and keywords. Although, if Search Engine Optimization isn’t applied or not done correctly it may back fire and not get your business the amount of traffic you were expecting. For example, if you started a business selling surfing gear and were locally known but not well ranked on the Internet; can be of many reasons. One being, your site is fairly new and the right SEO is not applied or the website has not been optimize for many months or not at all. With today’s competition business can be very competitive especially on the Internet. If your website isn’t being optimized your losing future clients and profitable gains in income. 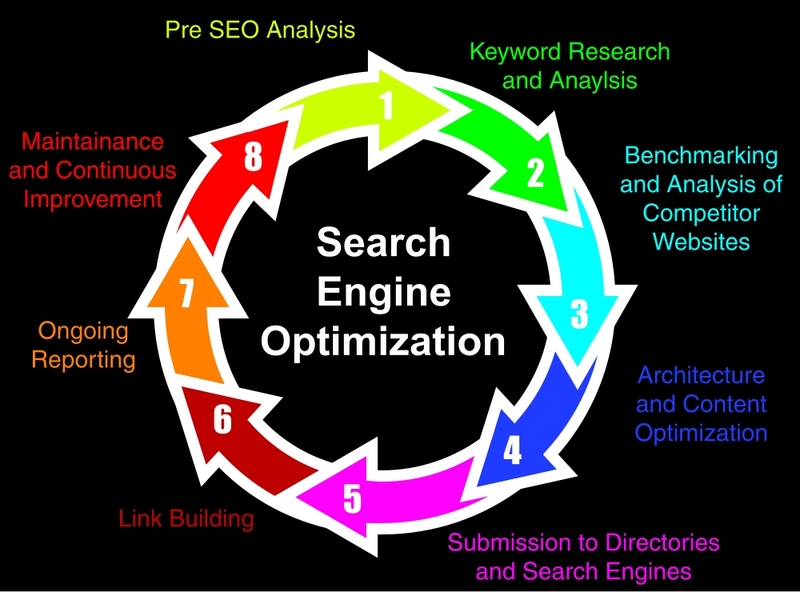 At R & R Consultants we provide you full service on Search Engine Optimization. 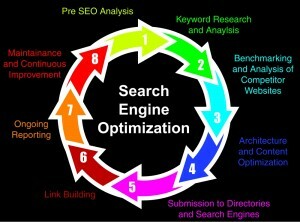 As seen above in the diagram we follow 8 steps ensuring you get the best optimization for your website. We work every step of the way to build your website to its full potential. With our professionals at R & R Consultants we take our time in researching the right keywords and data to improve the visibility of your websites to future clients. In addition, we keep you updated with the status of your website in regards to number of clicks and impressions of your site. With our experts at our R & R Consultants we’ll make sure you get the most out your website as you watch its growth in traffic from our SEO Optimization.